Subaru of America has been busy since the first release of the Dealer Set in 2015. Four new models joined the set between last December and this April: the 2016 Crosstrek 2.0i Premium/Limited and Forester 2.5i Limited, and the 2017 Impreza 2.0i Sport 4-door and 5-door. The Crosstrek has been a runaway success for Subaru, especially compared to the Outback Sport it effectively replaced. The 2016 model year brought a refresh to the Crosstrek, which included a new front bumper cover, interior improvements, and available Hyper Blue paint. This diecast may either be a Premium or a Limited - there isn’t anything on the exterior to differentiate the two trim levels. The detailing on this diecast is fantastic, with the exception of a few minor flaws (some chipped paint, and a tail light missing some paint). Hyper Blue is a bold, bright color. It’s non-metallic, but it certainly catches your eye. 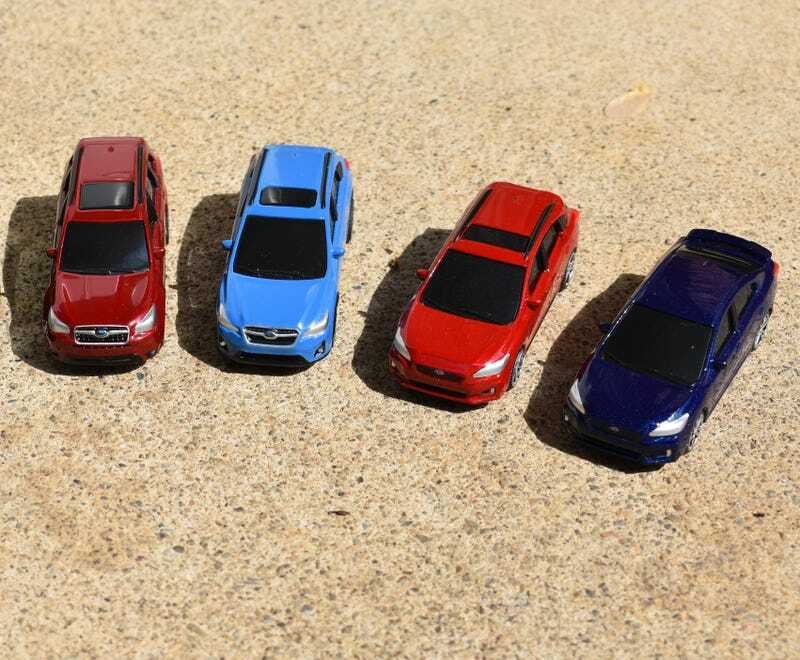 My only real complaint with the Crosstrek is one of scale - it appears to be a bit bigger than the rest of the line-up. I may be nitpicking, but they did so well with the first three. The Forester diecast is based on the pre-facelift 4th generation model (SJ) which was introduced for 2014. The SJ saw the biggest improvement in refinement and fuel economy to the Forester yet, while still retaining the all-weather and mild off-road capability it had always been known for. Similar, but different. Each has their strengths, but I think the Tomica version wins based on the crispness of the body lines. Again, the details are fantastic. I love that little Subaru emblem. The Forester is finished in Venetian Red Pearl, which is a nice change of pace from the Ice Silver and Jasmine Green you typically see the on the real thing. The Impreza is all-new for the 2017 model year, and is a big deal for the future of Subaru as it debuts Subaru’s new Global Platform which will underpin all new models for the foreseeable future. It is also the first Impreza to be built in America (if you’re in the North American market). The details are generally really good on this casting, too (aside from the rear quarter windows), though the tail lights are a little sloppy. The wheels are also supposed to be two-tone, but I’ll let that slide. There is one other flaw with this casting; have you spotted it yet? If you said the roof rails, then you would be correct. This casting is supposed to depict a 2.0i Sport model, which it gets mostly correct. However, unlike the previous generation Impreza Sport, the new Impreza Sport does not come with roof rails. I should also point out that the roof rails are only available in silver on the Impreza models that come with roof rails, not black. Nonetheless, it’s still a nice casting. That Lithium Red Pearl, a Sport trim exclusive, is also quite nice. Much of what I said about the 5-door carries over to the 4-door, minus most of the flaws. My version did have damage to the paint on the hood, but it’s fairly minor. Again, the wheels on the Sport models are supposed to be two tone, and the tail lights are actually quite sloppy, at least on mine. Other than that, the details are really nice. The sedan is featured in Lapis Blue Pearl, which looks quite dark except for bright sunlight. The full set so far, which spans from 2015-2017. Overall, they are an awesome collection. I do wish that they had actual interiors, but I do really like that the colors are actual Subaru paint colors. For being a lower volume diecast, the overall feel of these cars is quite good. If you’re a diehard Subaru fan and diecast collector, I can’t recommend them enough. The cars are available individually from SubaruGear, which is 20% off until 5/11/17 with the code FLASH20.